La Fiorentina is such a beautiful place, we couldn’t resist giving you a few more shots this absolutely gorgeous place. At the request of the villa’s owner Therese de Beauchamp, circa 1917, writer/architect-landscape gardener Ferdinand Bac sought to better distinguish the entrance with a kind of monumental pillar enclosure. 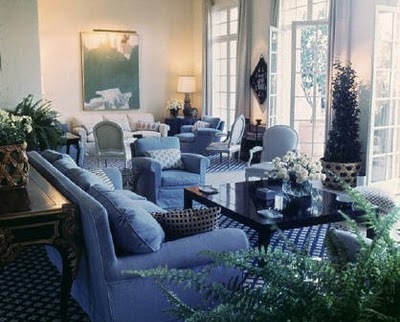 When interior decorator Billy Baldwin designed the interior for Mr. and Mrs. Harding Lawrence in the 1960’s, he used every imaginable shade of blue – from the sofa pillows to the checkerboard floor. What are your thoughts on Baldwin’s vision (below)? Whether discussing garden design, interior design or even fashion – great style is great style, and it is usually unique. When it comes to great style, Elizabeth Taylor was one of the top icons of her day. 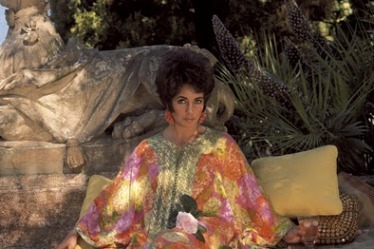 Recently, Vogue Magazine released a few photos of her at La Fiorentina in Saint-Jean-Cap-Ferrat France taken in 1967. Taylor was a regular guest at the Palladian-style villa which, as noted on Habitually Chic, had a very interesting design history. An Alexandra Lloyd Properties website states that it was built in 1917 by the countess Therese de Beauchamp on a vast piece of land which occupies the extreme end of the Saint Hospice point of the Saint Jean Cap Ferrat peninsula. In 1969, La Fiorentina was decorated by interior designer Billy Baldwin for his clients, Harding and Mary Lawrence.